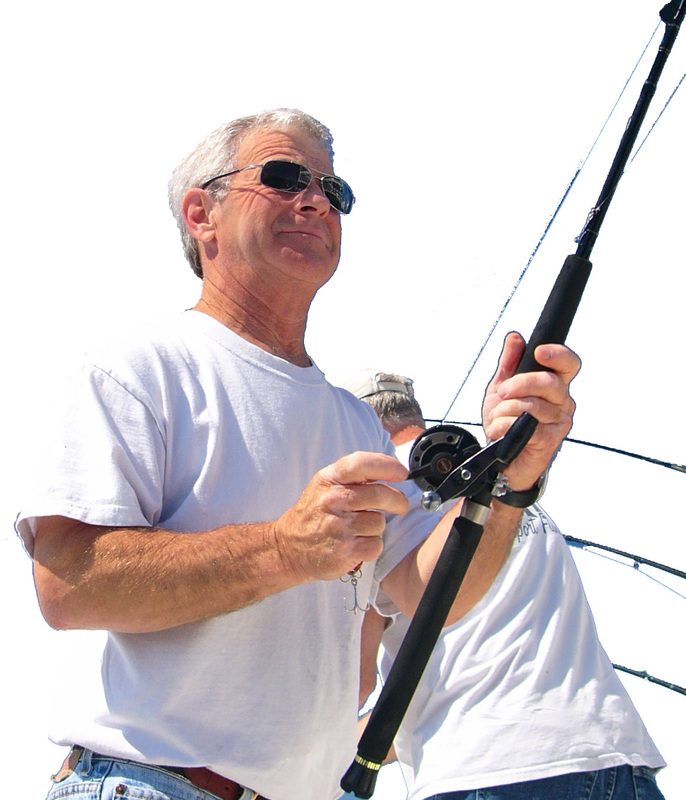 Captain Denny Grinold was given the Howard Tanner award for his contributions to the Lake Michigan fishery. Courtesy photo. 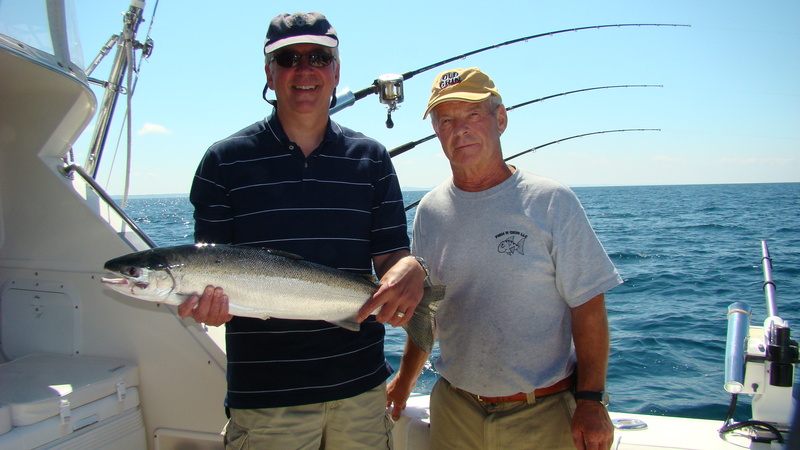 LANSING – Denny Grinold’s resume reads like the Who’s Who of Great Lakes fisheries management. Outdoor Life Magazine included him in a 2010 feature about the 20 best anglers on the planet. Even the Great Lakes Fisheries Commission has bestowed honors on him for his leadership. But it didn’t start that way for the 30 year veteran Lake Michigan charter fishing captain out of Grand Haven, who operates a 36 foot Bertram called Old Grin. Grinold, now 70, began fishing with his dad and brothers as a boy, hitting the little creeks around the family’s DeWitt home. Fishing, he says, continues to be “fun.” His customers may be newcomers, old hands, or even the Michigan Governor. Grinold was honored by the Michigan Salmon and Steelhead Fisherman’s Association in January. The group presented him with its Dr. Howard Tanner Award, named after the man behind Great Lakes salmon. It is presented only to individuals who make substantial contributions to the Great Lakes anadromous fishery. Michigan’s Gov. Rick Snyder holds up a steelhead caught while fishing with Grinold on his boat, Old Grin. Courtesy photo. Michigan Charter Boat Association and remains the organization’s head of state affairs. He is the chairman for the state’s Lake Michigan Citizen’s Advisory Committee and the U.S. Section of advisors for the Great Lake Fishery Commission to name just a few of the volunteer posts he holds. Grinold is best known for his level-headedness, his willingness to listen and his determination to gain consensus on issues that often raise the hackles of professional and hard-core anglers. That quality has earned him respect in spades. Grinold’s involvement with Great Lakes fishery issues began when the Lake Michigan Chinook salmon fishery collapsed in 1988. “There was a lot of finger-pointing as to who was responsible,” Grinold said. “Little was known about the life cycle of salmon. Grinold became a member of a special Lake Michigan task force that was convened by the state to examine what had happened to the salmon. That involvement became a turning point, catalyzing the citizen activist and problem solver within him. The group had identified the problem as Bacterial Kidney Disease, caused by the stress of having too many predators (salmon) in the lake. Anglers, until that point, had clamored for more fish to be planted. The finding spawned change within the Michigan Department of Natural Resources which began to screen for the disease and established charter boat reporting requirements, among other things. The task force then morphed into the Lake Michigan Citizen’s Advisory Committee, a group of angling stakeholders from up and down the shoreline that still meets to review fisheries issues. Grinold saw the value that came of it and how angler participation on the committee cooled some of the heated rhetoric and fostered better outcomes He and others began pushing for the formation of similar groups for other Great Lakes. “Denny is a bridge builder,” said John Robertson, former DNR fisheries chief and a personal friend. The two don’t always agree, but they enjoy their differences. “He gains consensus by capitalizing on shared values.” Robertson said. Grinold was selected by Michigan United Conservation Clubs as ‘Fisheries Conservationist of the Year’ in 2000. He said his current involvement at the federal level where is also the chairman of the Lake Michigan Committee of Advisors for the GLFC, grew out of what he what he learned on that first task force about how to work with others. This entry was posted in Uncategorized and tagged Deny Grinold, Fisheries, Fishing, Grand Haven, Great Lakes Fisheries Commission, Howard Tanner, Michigan Salmon and Steelhead Fisherman's Association, Michigan Steelheaders, Old Grin. Bookmark the permalink. We always enjoy and really appreciate Denny’s support for the Great Lakes fisheries. Thank you Denny! As noted, “Denny is a bridge builder,” said John Robertson, former DNR fisheries chief. Yes that is certainly true as shown by the photo of Denny with that Republican enemy of the Great Lakes sportfishermen.